Globalisation is a complex and controversial issue. 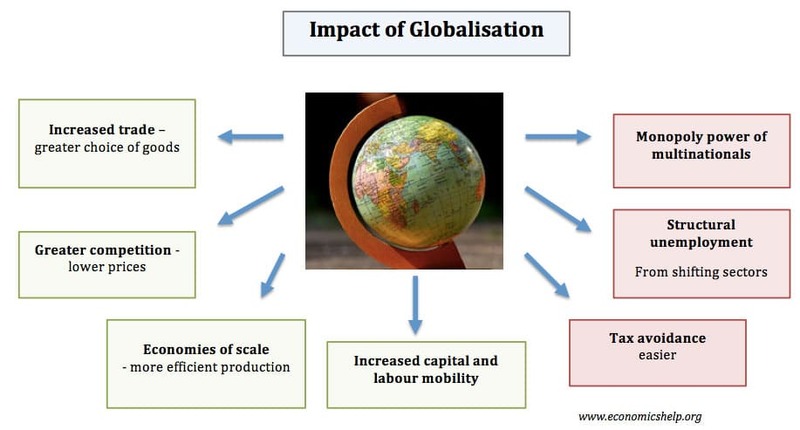 This is a look at some of the main benefits and costs associated with the greater globalisation of the world economy. Definition of Globalisation The process of increased integration and co-operation of different national economies. It involves national economies becoming increasingly inter-related and integrated. The growth of multi-national companies. Increased integration of global trade cycle. Increased communication and improved transport, effectively reducing barriers between countries. Greater choice of goods, e.g food imports enable a more extensive diet. Increased labour migration gives advantages to both workers and recipient countries. If a country experiences high unemployment, there are increased opportunities to look for work elsewhere. This process of labour migration also helps reduce geographical inequality. This has been quite effective in the EU, with many Eastern European workers migrating west. Also, it helps countries with labour shortages fill important posts. For example, the UK needed to recruit nurses from the far east to fill shortages. However, this issue is also quite controversial. Some are concerned that free movement of labour can cause excess pressure on housing and social services in some countries. Countries like the US have responded to this process by actively trying to prevent migrants from other countries. Production is increasingly specialised. Globalisation enables goods to be produced in different parts of the world. This greater specialisation enables lower average costs and lower prices for consumers. Domestic monopolies used to be protected by a lack of competition. However, globalisation means that firms face greater competition from foreign firms. Globalisation has also enabled increased levels of investment. It has made it easier for countries to attract short-term and long-term investment. Investment by multinational companies can play a big role in improving the economies of developing countries. 1. Free trade can harm developing economies. One problem of globalisation is that it has increased the use of non-renewable resources. It has also contributed to increased pollution and global warming. Firms can also outsource production to where environmental standards are less strict. However, arguably the problem is not so much globalisation as a failure to set satisfactory environmental standards. Globalisation enables workers to move more freely. Therefore, some countries find it difficult to hold onto their best-skilled workers, who are attracted by higher wages elsewhere. Globalisation has led to increased economic and cultural hegemony. With globalisation there is arguably less cultural diversity; however, it is also led to more options for some people. Multinational companies like Amazon and Google, can set up offices in countries like Bermuda and Luxembourg with very low rates of corporation tax and then funnel their profits through these subsidiaries. This means they pay very little tax in the countries where they do most of their business. This means governments have to increase taxes on VAT and income tax. It is also seen as unfair competition for domestic firms who don’t use same tax avoidance measures. ← Who does the UK owe money to? hey guys i’m looking for the benefits of developing countries and developed countries and have had no luck could anyone help? I’ve just been reading a Stiglitz article (he used to be chief in the IMF/World Bank) and “globalization of knowledge” has been one benefit for developing countries. But sadly it depends on the side that you’re on. Economists will reel off the benefits of trade between countries, capital flow and labour flow. Anthropologists and social scientists will explain a lot of inequalities – the rich on a global scale have got richer and the poor, well guess what? yep, not a lot has happened there. Social science will detail (Stiglitz does too) how developed countries have profited off the poor, even via aid agencies and finance institutions such as the World Bank, IMF and WTO, who are supposed to be acting in developing countries best interests.